Nicknamed the hockey wizard the world over, Late Major Dhyan Chand’s 113th birth anniversary which is being observed as National Sports Day in India, was celebrated with great pomp and show in Silchar of Assam on Wednesday. 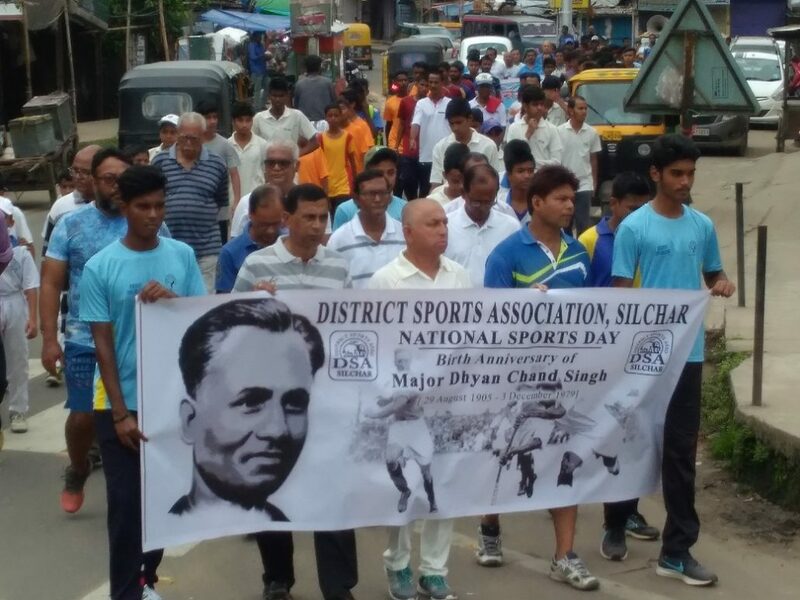 Paying rich floral tributes by the members of District Sports Association (DSA) of Silchar, a rally was taken out from DSA ground in the morning with close to 200 sportspersons of all age groups taking part in it. DSA’s members accompanied by sportspersons of various academies also formed a human chain and walked through several streets of Silchar. Keeping the spirits and wizardry of Late Dyan Chand in mind, DSA Silchar also organized a friendly hockey match between the DSA President’s XI and DSA Secretary’s XI later in the day. Subimal Dhar, general secretary of DSA Silchar informed that an exhibition hockey match between the President’s XI and Secretary’s XI of DSA was played to mark this day, wherein, mixed teams of boys and girls played against each other. The boys should not undermine the quality of the girls, while the girls should feel that they are as good enough as the boys, he added. Keeping in mind to observe National Sports Day, Ramanuj Gupta Memorial Super Division Football League of DSA Silchar would also be kicked off on Wednesday evening, said Subimal Dhar.